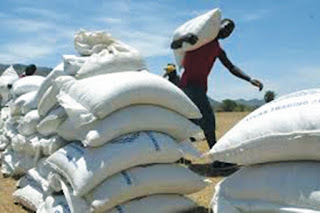 Hippo Valley Estates last month donated 44 tonnes of maize to hungry villagers of Mwenezi as many of them are struggling to feed their families since the departure of The World Food Programme from the area. Villagers in some parts of the district said the departure of (WFP) in March had left them stranded as the price of mealie-meal has beyond the reach of many. "The situation has now become very hard because the WFP has left. Most of the people here can no longer afford to buy food from the shops. So we are very pleased with Hippo Valley's assistance," said Bilton Mangwende who comes from Ward 6. Councillors in the district have also welcomed Hippo Valley's contribution, saying the donation will make life easier for the poor people of Mwenezi. Ward 3 Councillor, Samuel Mabhena said many villagers had started selling their livestock at lower than market prices to save their families from hunger. "Villagers have started selling their goats and cattle so that they buy some food for their families. It is a loss to them because they sell the livestock at give-away prices," Mabhena said.